So you’re looking to increase the profitability of your blog for the Christmas period (and beyond). You’ve optimized your AdSense, Chitika and Affiliate programs, you’ve even written a little seasonal content…. but there’s one missing element…. Traffic. Unless you actually have people viewing your blog it is very difficult to actually earn anything from it. So how do you drive traffic to your blog? I’ve written quite a bit of this previously in a number of posts (for example here) but want to spend a little time talking today about Search Engine Optimization (SEO). When you are looking online for information on a topic where do you go first? While I’m sure there will be a variety of answers given to that question – the majority of average web users would answer with one word – ‘Google’. Every day Search Engines like Google send many millions of web users to websites in their index. While there are plenty of Web 2.0 web indexing services around that are increasing in popularity – the fact is that search engines like Google, Yahoo and MSN are still the biggest source of traffic to websites on the web. As a result – learning how to be indexed and ranked well by them seems like a no brainer. Some bloggers have a problem with the idea of optimizing a blog for search engines. They argue that rather than writing for search engines a blogger’s sole focus should be that they write quality content for humans. I personally don’t see that writing for humans and search engines have to be mutually exclusive things – in my opinion both can be achieved without compromising either. Some bloggers argue that if you write for humans that SEO looks after itself. To some extent I agree with that – if you do write quality content that others like you will find that they link up to your site (a key in SEO) – however I would argue that incoming links from other sites is just one part of climbing the rankings in Search Engines (an important part but not the only one). There are other factors that come into play also and I believe that by knowing them and naturally incorporating them into your blogging you can increase your chances of being found by readers in Google, Yahoo and MSN. Of course – some people become a little obsessed with SEO and forget the human reader, don’t fall for this trap and keep a balanced approach and you’ll benefit both from traffic from the search engines as well as a loyal readership who keeps coming back for more quality content. I’ve written previously on this topic so rather than writing the same thing again in a slightly different way will republish some of my previous tips below. I hope you find them useful. Before I start – I’ll say that while I do get a lot of SE traffic that I’m not really an SEO expert (it isn’t what I devote most of my time to). If you want to read something by someone who has spent a lot more time and effort on the topic I recommend looking at an e-book by Aaron Wall – SEO Book (aff). I’ve actually been reading through it in the last few weeks (it’s been on my to do list for a long time) and have found it really helpful. SEO experts tend to divide search engine optimization techniques into off site and on site techniques. Off site SEO techniques are as the name suggests factors from outside the site itself (ie from other sites) that impact the blog’s ranking in search engines. Many of these factors are outside the blogger’s control – however they are useful to know. The most obvious and probably most powerful offsite factor are Inbound Links (something I’ve already referred to above). It is generally agreed that the links that point to a website are one of the most powerful way of climbing Search Engines results pages (in fact many argue it is THE most important factor). – To put it most simply – every link to your site is seen by the search engines as being a vote of confidence in your site. Whilst you may not have complete control over who links to you these are the types of links that you should be dreaming of. How to generate quality inbound Links? Of course whilst most of us know this it doesn’t make getting such links any easier – its in the hands of others in many cases. So how do you get such links? Quality Content – There are all kinds of link generating systems out there but in my opinion the best way to get links to your blog is to write quality content that people will want to read. You can solicit links with others or sign up for different link building programs or even buy text links on other sites but the cheapest and probably safest approach is to build inbound links in a natural organic way as others link to your quality content. Notify Relevant Bloggers of your content – Whilst I don’t advocate spamming other bloggers and asking for links – I would recommend that if you write a quality post on a topic that you know will interest another blogger that it might be worth shooting them a short and polite email letting them know of your post. Don’t be offended if they don’t link up, but you might just find that they do and that in addition to the direct traffic that the link generates that it helps build your own page rank in the search engines (more on letting other bloggers know of your posts here). Directories – Another way to generating inbound links is to submit your links to directories. I know of webmasters who swear by the benefits of such a strategy – the first thing that they do when starting a new site is to do the rounds of directories – submitting links to key pages with appropriate keywords in the links. There are loads of directories out there – many of which offer a free submission. Ari Paparo has compiled a list of blog directories that you might want to start with. Inter-link your Blogs – Increasingly bloggers are starting or joining blog networks to enjoy the benefits of multiple sites and writers working together. One of the advantages of networks of sites is that they usually link to one another. In doing so you have complete control over how your sites are linked to from multiple domains. It is worth noting that you should be careful with this approach – if all your sites are hosted on the one server many think that Search Engines will work out what you’re doing and the impact will be lessened. Buy Links – Many professional web masters have a budget to purchase links from other highly ranked and and relevant sites. I won’t go into this too much here but you might like to read more about it in my recent post On Buying Text Links. Swap Links – Similarly many bloggers swap links with other bloggers. Sometimes this happens pretty naturally (you see someone linking to you so you link back) but in many cases the links are strategic ones and formally arranged between site owners. I get daily requests for such reciprocal links (I rarely act on them). Whilst there is some benefit in such link swapping I would again advise caution here as many SEO experts believe that the search engines have methods for tracking such strategies and devaluing the links. Some try to get around this by doing indirect or triangulated links. ie instead of site A and B doign a direct swap they involve other sites. So A links to C in exchange for D (also owned by C) linking to B (also owned by A) – makes your head hurt doesn’t it!?! There are also a variety of systems around that say they’ll take care of such interlinking for you – I know many who use Digital Point’s Free C0-Op Advertising system. Personally I tend to avoid such schemes and have a policy of linking to sites I think are valuable to my readers. If they link back then so be it. How do I want people to find this post in Search Engines? What will they type into Google if they want information on the topic you’re writing? How would I find information on this topic in the Search Engines? What results come up when I do plug these keywords into Google? What other keywords are other sites using? The answer to these questions will give you a hint as to what words you’ll want to see repeated throughout your article a number of times. Keywords in outbound links. Of course you should always link to sources of content as an ethical consideration but the bonus of this is that many SEO experts think that linking to relevant and quality sites on the same topic of your post with good keywords can also add credibility to YOUR post also. Of course you can go over the top with keywords in posts and let it destroy your content – but if it fits with what you’ve written tweak it to include the words you are targeting a couple of extra times. Most SEO experts recommend getting your keyword density up to between 5-20% – I think 20% is probably bordering on massacring your content. One last word of warning and disclaimer on keyword rich content (because I can just hear the comments on this post already) – don’t sacrifice your readers experience of your site just for the sake of SEO. Yes keyword density can be important in climbing the search engine rankings – but more important is that your content and design are user friendly and helpful to readers. There is nothing worse than a site that is stuffed with keywords – these sites come off as cheap, nasty and spammy – don’t fall for the temptation. Keep in mind keywords that might be specific to the season we are approaching. While during the year there might be less people searching for posts relating to Christmas, gifts, presents, new year sales etc – this time of year will see an increase in these types of searches. 2. Themed sites – One of the growing theories of SEO is that you are more likely to rank well if you have a substantial amount of pages on a similar theme. ie a niche topic blog will probably rank higher than a general one that covers many topics. Build a blog with over 200 pages of content on the same theme and you’ll increase your chances of ranking well as SEs will see you as an authority on the topic. The take home advice here is to keep to some kind of a topic/niche/theme for your blog. It is also probably another argument for categories and tagging posts that relate together strongly. 3. Site Design – Search Engines like well laid out, well coded and easily to navigate sites. Make sure your pages validate (I need to work more on this) and that they are viewable on all major browsers. Search Engines don’t tend to like too much Flash, Frames or Java Script in your site – keep it simple and clean and their robots will index your site a lot faster and more accurately. Also try to keep your blog free from dead links (a challenge for those of us with older blogs with big archives). 4. Interlink your Site – The way Search Engines index your blog is to send little robot crawlers to your site to track what you’ve written and follow the links. Make it easier for them to get around your blog by using internal linking wisely. Most SEO experts recommend that you provide some sort of Site Map that means every page on your blog is just a link or two away from every other one. One way to do this for bloggers is to make sure that your category pages are in your sidebars as I do in this blog. Also make sure every page links back to your main page and any other important pages on your site. If you’re writing on a topic you’ve previously written about consider linking to what you’ve written before or use a ‘other relevant posts’ feature at the base of your article. You’ll see in my menus at the top of the page a number of my key categories and articles. One of the impacts of having them highlighted in this way is that they have become some of the most highly ranked pages on ProBlogger simply because they are linked to from every page of this blog. This is a key point in the lead up to Christmas – if you have a few seasonal posts that you particularly want to do well in the SE’s make sure they are linked to from every page on your blog. 5. Update regularly – The more you update your blog the more often Search Engines will send their crawlers to your site to index it. This will mean your new articles could appear in the index within days or even hours rather than weeks. This is a natural benefit of blogging – make the most of it! 6. Outbound Links – There is debate over how SEs treat outbound links from your blog. I’m in the camp who believe that relevant outbound links enhance your site’s ranking in search engines. I always link out to quality relevant sites that I think my readers will find useful and have a little anecdotal evidence that seems to support the theory that this is healthy for the way SEs index you (check out Waynes article on the topic for more info). Linking to sites outside your own blog does mean you end up sending traffic away from your blog so you need to count the cost of such a strategy. Note that you should always try to link to reputable and relevant sites to your own page. Also keep in mind that too many outbound could have detrimental impact upon your blog. Like in most things in SEO – moderation is the key. 7. Choose your domain name wisely – there are numerous factors to keep in mind when selecting a domain name. For one you might like to include your keyword in it if possible. Secondly you should do a little research to see if someone else has previously used the domain. This could have both positive and negative impact. If it was a quality site with inbound links you might reap some benefits but if it was a banned spam site you could still be banned from Google for a long time. One service you might want to use to check expired domains is Way Back Machine at Archive.org. 8. Register your Domain for a Lengthy Period – a recent patent by Google indicates that it now looks at the length of your domain’s registration in ranking it. It does this because many spam sites have short registrations and a longer one indicates that you’re building a site with substance and are in it for the long haul. 9. One topic per post – the more tightly focused the theme of a page the better when Search Engines come to rank it. Sometimes you might find yourself writing long posts that end up covering a number of different topics. They might relate loosely but if search engine ranking is what you’re after it could be better to break up your post into smaller more focused pieces. 10. Write optimal length posts – there is some thought going around the Search Engine Optimization community that pages that are too short can get passed over for high rankings. I try to keep posts at least 250 words. Of course there are some posts on my blogs that are shorter, but if I’m writing a post that I want to rank well I try to give it some meatiness in terms of length. On the other hand don’t make it too long either – because in doing so you make it difficult to keep your keyword density up and could end up with a less tightly focused page. Research also shows that longer articles can have a pretty steep drop off rate in readers after the text gets below the ‘fold’ or to the end of the first screen of article (looks like this post is in trouble – is anyone still reading?). 11. Avoid Duplicate content – Google warns publishers in its guidelines about having the same content on multiple pages. This goes for both multiple pages that you own but also pages that others own. This is because a tactic of spammers is often to reproduce content on many pages and/or to steel content from other sites. There is some debate over what duplicate content does and doesn’t include (for instance many bloggers use ‘free articles’ as content on their blogs – these articles often appear on hundreds and even thousands of other sites around the web and to me could be seen as duplicate content) – my advice is to be very careful about how many places your content appears. I do republish occasional posts (or parts of them) but try not to do this too much and attempt to add elements that are unique on each occasion that the posts are republished). 12. Ping – services like Pingomatic (there are numerous others too) will ping a variety of websites for you to notify them that you’ve updated. In doing so you’ll also be letting search engines know that you’ve updated which will trigger their robots to come visit your blog. I’d also suggest pinging Google’s blog search tool. 13. Submit your RSS to MyYahoo – submitting your RSS feed to MyYahoo seems to help with getting indexed on Yahoo. Read more about this at Getting Yahoo Traffic for your Blog. Some also think that doing the same thing to Google’s Personalised pages could have a similar impact. 14. Quantities of Content – I always get into trouble when I write about having lots of content – but I think its true that bigger sites tend to rank better than smaller sites – whilst it is possible to rank highly with a small site – it’s probably not the norm.. Search Engines will see your site as more comprehensive the more content you have. You also better your odds of being found in Search Engines if you have more pages. By no means am I saying just to put up random junk content – be careful about this – rather work at building a comprehensive and large site over time. 15. Submit to Search Engines – You can do all the best onsite SEO strategies in the world and still get no where because the Search Engines have not found you to start with. Each search engine has a way of letting it know about your site – submit your URL to be included in the index. Please note that this takes time and perhaps a quicker and more effective way is to get linked to by a site already indexed by the search engine. I’ve written a post about his previously here. You might also like to tryout some of the services around that offer to submit your sites to search engines for you – I’d be wary of paying for this sort of service though. I never have and seem to do ok.
One more element that I think is often overlooked in SEO tips posts is that of ‘Time’. My own experience of blogging is that you can do all of the above things and still not be ranked well in the Search Engines for months and months. Here at ProBlogger it actually took around a year before I started to get significant search engine traffic – despite me doing all the ‘right things’. This might not be particularly good news for those of you wanting to optimize your site for Christmas this year – but it is yet another reminder that blogging is a long term thing and that it takes considerable time for a blog to become established. If you’re not ranking well in the search engines – hang in there. Keep posting, keep working on quality content and keep the above factors in mind – as you do this you’ll find that in time your SE traffic will gradually increase. 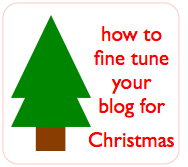 This post has been a part of the How to Fine Tune your Blog for Christmas Series. I have just started a food blog and I think your tips will help me, carry on with your good work as you really do know what your talking about. Your blog has been a great read, feel free to come over to my blog anytime to have a look at my daily recipes which I make each day, your very welcome. great tips – thanks for these! With the burgeoning popularity of the internet, new developmental tools are created daily. With these tools come new challenges, marketing, design, cross-browser transitions, etc. All of these can be a daunting task for those web gurus who aren’t well-versed in the W3 Standards. Yes, your post is still alive even if it has been a whole month since the last comment was made. Well, I must say you are doing something correctly because I did a Google search for “how do I submit my blog to the search engines” and I think you were number 2 or 3. Kudus to you! I am new to blogging…having just launched our blog 4 days ago. I have added this page to my favorites as I am sure I will be using it as a checklist in the weeks to come. My husband also ordered the SEO book for me (now if he would only read it for me and tell me exactly what to do I’d be a happy camper..haha). Because I am new to blogging, I am COMPLETELY lost with all the options in WordPress & Feedburner and what I should do and what I shouldn’t do. I also cannot get my template to work correctly, but hopefully we will get that resolved soon. I would love to see another lengthy post of yours detailing what every blogger should know about which widget, plugins & other options to turn on in their blog because I haven’t found a post like this yet. If you want to do a post in “interview” format, I would be happy to be your “interviewee” and tell you where I’m having problems or things I am clueless on so that maybe you can help other people out there that are having the same problems as me. I’m afraid a large percentage of your information is outdated and just plain wrong. For instance; submitting to search engines has been a no no for quite a long time. One can actually be penalized for this and at the very least, indexing will be delayed significantly. Blogs are not included in Google (as are NOT “normal” websites”) for “registering your url for a lengthy period” and it is still questionable if this ever was detrimental. 1 year is plenty and the registrars want you to believe this lie so they can make more profit. None of the SE’s cares about how long the initial registration is for and few even have the algorithm to check it out. Google doesn’t even go to this trouble any more. I know large numbers of successful bloggers who started and are even still in their first year of “registration for only 1 year” with their url. I have 3 blogs that are less than 8 months old, registered for just 1 year, that are bringing in 4 to 6oo hits daily, with page 1 indexing for most keyword “long tail phrases” (which you also don’t talk about). You did not include anything on social networking or web2.0, a major influence on potential traffic. There are a number of other “out of date” entries here, which leads me to thinking you are just a little out of touch with what is going on now. Time to “re learn” the fundamentals so you don’t teach the “wrong stuff”. Will this entry be posted? I doubt it. Did you stop to check that this post was written in November of 2006 before you ranted like that? Darren would never delete a comment that voiced an opinion unless it was purposely crude – but that doesn’t stop others from noticing that you’re the one who’s decided to attack something without even bothering to look at the publish date. web2.0 was barely around then, for one thing. That said, you’re incorrect in much of what you said… submitting a site to Google the PROPER way isn’t going to hurt anyone. Doing it every day for months and spamming your way in will. I know plenty of blogs that are included in Google’s “normal results” – not sure what you’re talking about there. Once again, no one talked about “long tail” in ’06 so your point is irrelevant. Maybe you could’ve gently suggested that Darren make some updates to this post, but since you couldn’t be bothered to look at the date, maybe you would’ve not thought of that either. Lare – thanks for your comment. Like Lara points out – this is a post that is approaching a year old. That’s the nature of blogs – with over 3500 posts on this blog it’s not possible to keep going back through them all to update them all. In terms of the registration for 1 year – I’m not saying that a long registration will ensure high rankings – however around the time that I wrote this post a Google patent document said that it was a factor. I doubt it’s a major factor – but these things add up. I’m sure there are many blogs out there that rank well with 1 year registrations – however if it has a chance of increasing my blog’s rankings even a little bit and it only costs me a few dollars extra then I don’t see the problem in a longer registration. In terms of social media – you’re right, I don’t mention it in this post – but do a search of my blog and you’ll find hundreds of other posts that do. You can’t possibly write every tip in every post. This is actually a post about optimizing a blog for ‘search engines’ (hence my title is ‘How to Optimize Your Blog for Search Engines’ – so I kept the content focused upon that. I guess all I’m saying is that a blog needs to be read in context with the date a post is written and the rest of the entries on that blog. Like Lara says – if you want to critique me – feel free to do so – but perhaps you could be a little constructive about it. It’d also be nice to know who you really are – if you’ve got a blog why not link to it and show us all how someone who knows what they are talking about does it? Great post. I do believe, personally, that many factors are becoming obsolete. Keyword density is not as much important as the way it is laid on page and its varieties. This is also true about the anchor text that should be diversified for more of a “natural” linking behavior,Even if dealing with the same page and same keyword. I agree EITAN about the anchor text that should be diversified for more of a “natural” linking behavior and thanks for made me focus on some important SEO tactics . Finished reading, now time to work. I was ignoring this for a long time, and it cost me so much. Great post, thank you. wow.. thanks for that. :) i am relatively new to all this blogging and seo.. it has been very informative! Darren, great blog… Lots of great information. Thanks! Just on the point on buying links, I personally would advise against this. We once bought links off a site, which actually reduced a Google Page Rank on one of our sites. Good SEO is like wine, it matures with time. Be patient. Once again thanks for the information. I was searching Google for ways to increase search engine traffic and once again your blog was at the top. I have signed up and used two of the sites you listed in this post. Well Darren – your advice speaks for itself. You had the #1 spot for “add blogs to search engines.” Thanks for your help. Thanks for those wonderful tips.. I just recently start blogging and I was directed to your page when i search for “how to optimize a blog”.. Good work and I’m very impressed.. Thanks and I’ll continue to read! I want to promote my website in SE’s can any one say me some tips to do the same. Awesome post…. i was just doing some research before starting my blog, this was an excellent piece of information. thanks for all the help. I need to apply all of these to my blog. Thanks! Excellent post!! I’ve purchased some SEO materials in the past and they weren’t as helpful as this post. Would most of the same steps apply to a regular html/php site? Anything particularly different that should be done with a regular site? You should teach a course on SEO…. Wow! I must say that of all the websites I’ve come across since venturing into the blogging world, yours has been one of THE most informative. Great, great information, thanks for sharing. I will continue to take advantage of your advice. Thanks! I was just hunting for some On page stuff and I came across this excellent article, I think this is really gonna help a lot for me as for as the SEO of Blog is concern. After going thru so many articles I came to know that to make a blog is very easy now a days and to get it optimized is also bit easier then before. thank you very much for sharing this information. Nice tips, I mean this is info should be a must for every blogger. Great Tips, Its really helpful to increase a traffic on the blog..
You really get under the skin of this one… excellent. Particularly the emphasis on not sacrificing content/quality for SEO. If it’s relevant and it’s well written, it’ll fly.